Developer(s) of original games: Atari, Inc.
Arcade Smash Hits is a compilation of three arcade games developed by Atari. 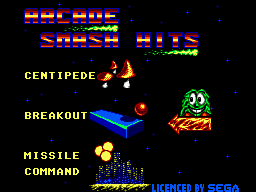 It was released for the Sega Master System in 1992, and contains ported versions of Centipede, Breakout, and Missile Command, each with graphical and audio updates. The compilation was only released in Europe. Main article: Arcade Smash Hits/Magazine articles.